Machado might have brushed Murphy as he spun out of the box and looked up at the ball while Murphy moved to catch the popup about 10 feet down the first base line. As he ran by, Machado tossed down his bat near Murphy’s feet, though the bat did not touch Murphy and was not in his path. The catcher dropped the pop foul, but plate umpire Bill Welke signaled for interference and called Machado out. The catcher had a clear read but then lunged slightly at the last second and moved his head as the ball popped out of his glove. Green came out to argue with Welke and was ejected. Green slammed his cap to the ground. Asked if he made contact, Machado said: “Not that I was aware of. Honestly I didn’t even know what was going on until Andy came out there and started arguing. I had to ask him, was I out, was I safe, and he was like, ‘Uh, I don’t know.’ At that point I went back to the batter’s box. Machado has been criticized in the past over his baseball ethics. He was called a “dirty player” by NL MVP Christian Yelich during last year’s postseason after stepping on Brewers first baseman Jesus Aguilar’s leg while running out a groundout. Green said he had no idea how Welke interpreted the play. Fans booed Welke for the rest of the game. Greinke became the first pitcher with a multihomer game and 10 or more strikeouts since Madison Bumgarner did it for San Francisco at Arizona on opening day 2017. Bumgarner’s first homer that day was off Greinke. 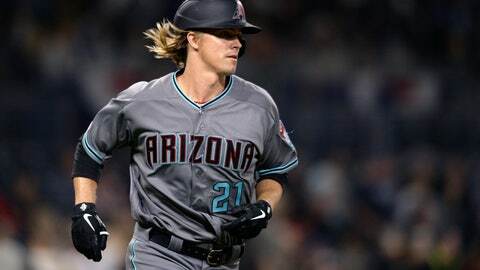 Greinke stunned left-hander Eric Lauer (1-1) and the Padres with a three-run, 413-foot shot to straightaway center field with one out in the fourth to give the Diamondbacks a 4-2 lead. He then hushed the crowd at Petco Park when he homered again off the lower balcony on the Western Metal Supply Co. Building in the left field corner in the sixth. His second homer followed Murphy’s monster shot off the railing on top of the four story brick warehouse, his first. Greinke’s homers were his first since hitting two during the 2015 season while with the Los Angeles Dodgers. He has eight in his career. His four RBIs are a career high. He got the silent treatment in the dugout. “It was the first time I wanted anyone to talk to me all year and they didn’t want to talk to me then,” he said. Greinke allowed Renfroe’s two-run homer with two outs in the first. He allowed two singles to open the second and then retired the next 13 batters, including striking out the side in the fourth. The right-hander allowed three runs and six hits while walking none. Greg Holland pitched the ninth for his second save in two chances. On opening day, Greinke allowed four home runs and seven runs on seven hits in 3 2/3 innings of a 12-5 loss at the Los Angeles Dodgers. After Machado was called out and Green ejected, Renfroe followed with his second homer to pull the Padres to 6-3. It was his sixth career multihomer game. Walker’s homer in the seventh, his third, gave the Diamondbacks a three-run lead before Myers hit a pinch, two-run homer in the bottom of the inning. Padres rookie shortstop Fernando Tatis. Jr. made a twisting, turning, leaping, tumbling highlight reel catch of Greinke’s poke to shallow left to end the second. Diamondbacks: LHP Robbie Ray (0-0, 5.40) is scheduled to start the series finale Wednesday afternoon. Padres: LHP Joey Lucchesi (1-0, 0.00) gets the start for San Diego.